Nearly three quarters of employers in a recent poll say retaining female talent in the workforce is the most important issue in HR in 2017, as changes to childcare funding could impact on the recruitment and retention of working mothers. 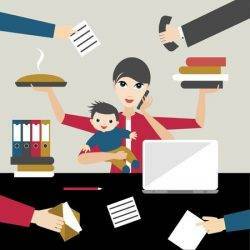 The research, which was carried out by My Family Care and recruitment firm Hydrogen, found that most employers thought that flexible working and supporting working parents and carers was important to them but strikingly, nearly three quarters (70 percent) rate the issue of retaining female talent after parental leave as the most important issue. However, 60 percent of HR professionals said their company provided no form of coaching or training support for their employees going through the parental transition. When it comes to the success of their family friendly initiatives, flexible working proved to be the most successful, followed by their Childcare Voucher Scheme and then enhanced maternity or Shared Parental pay. When employees choose to take time off with the arrival of a new baby, it seems the enhancement of Shared Parental pay is still far behind the enhancement of Maternity or Adoption pay with 57 percent of respondents enhancing the latter, but just one in four (25 percent) enhancing Shared Parental pay (SPP). Childcare Vouchers will be replaced next year which will bring an enormous change in the way the government supports their parenting population. With the increase of free childcare from 15 hours to 30 hours per week for three to four year olds – and tax free childcare set to launch – many employers are searching for new and innovative ways to replace their offering of childcare vouchers and promote their family-friendly ethos. Ben Black, CEO of My Family Care says: “Every HR professional wants to know how they compare to their competitors when retaining and attracting talent and so we hope this report proves insightful. My Family Care’s Childcare & Family Friendly Benefits: Employer Survey and Parental Leave Benchmark is available to download here.